It might look like a comic book from the outside, but in reality, the new book authored in part by APHA's executive director is both entertainment and an important teaching tool. "The Quest for Health Reform: A Satirical History," is a collection of editorial cartoons tracing the movement for universal national health reform. APHA's Georges Benjamin co-authored the book with Theodore Brown, Susan Ladwig and Elyse Berkman, and all four authors were on hand today to sign copies of the book at the Public Health Expo at the Annual Meeting. "It presents information in a way that is interesting to me," said Khalid Almutairi, an associate professor at King Saud University in Saudi Arabia. Almutairi said he will use the book in his class to help his students understand the movement for health reform in the United States. "The way we look at the U.S., it's like a benchmark," he said, holding his signed copy of the book. "We can benefit from the experience of the U.S., so we need to watch what (you) do. It's a great way for our students to have experience with what's going on in the West." For Jean Demmler, chair of APHA's Mental Health Section, the book will be a prize. At a Section gathering during the Annual Meeting, she'll present it as a gift to one of the Section's 40-year members. "I just think it's a fun way to see (health reform) from a new perspective," she said. 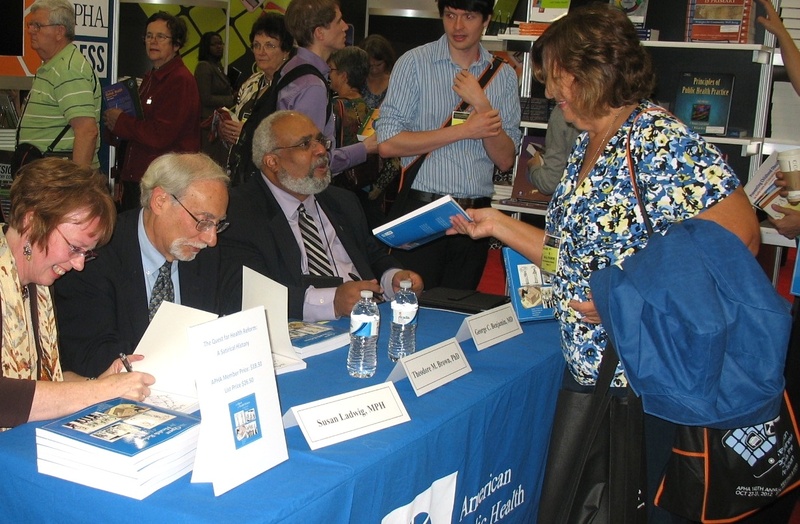 "The Quest for Health Reform: A Satirical History" is for sale at the APHA Press booth, #1925, in the Public Health Expo.